The world’s top Olympic sailors are heading to Scotland for one of the final showdowns prior to the 2012 Olympic Sailing Competition. 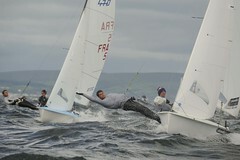 The 470 European Championship 2012 is set to be hosted in Largs, Scotland from 25 June – 4 July 2012. Host venue, Largs Sailing Club in Ayrshire is one of Scotland's premier dinghy and keel boat racing clubs, and boasts a state of the art clubhouse, with immediate access to some of the best and most scenic racing water in Europe. Located on the west coast of Scotland, about 30 minutes’ drive west of Glasgow, Largs is a well proven championship sailing venue. Events recently hosted include the 2009 RYA Volvo Youth National Championships, 2009 Optimist UK Nationals and the 2010 Laser Radial Worlds. 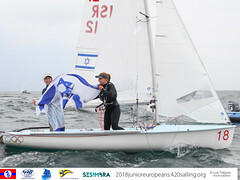 The 470 European Championship is set to attract in excess of 100 men/mixed and women’s 470 teams, and is a key fixture on the international calendar. Many teams will go straight from Scotland to represent their nations on the start line at the 2012 Olympic Sailing Competition, just over a month later. 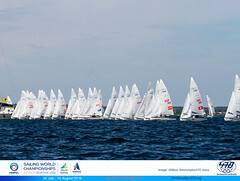 The Championship will be sailed over several race courses with the men/mixed and women fleets sailing separately. 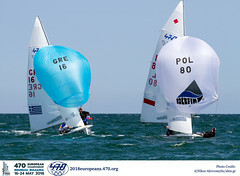 Racing gets underway on 28 June 2012 and boats will be seeded, based on their past performance, for the 6 race qualifying series into fleets of around 40 boats. Teams will then be allocated to the gold and silver fleets for the final series, and after a further six scheduled races the top 10 teams from the gold fleet will make the cut to the final medal race show down on Wednesday 4 July 2012. Local sailing star Luke Patience grew up on the waters off Largs, and will be representing Great Britain with crew Stuart Bithell in the 470 men event at the 2012 Olympics. Familiar with the conditions, Patience gives teams some top advice, “Largs is a diverse place to sail. Like Weymouth, it hosts all sorts of weather conditions and you can have anything thrown at you. The 470 Championship in Largs will crown a well-rounded sailor. We get all weather systems coming through from the Atlantic.” Patience summed up his homeland by concluding, “Scotland is quite probably the most stunning country in the world. It is so vast in beauty and so small in size. There are few places in the world where one moment you are staring across the sea into the west with nothing between you and America, with a gorgeous sunset, and the next you are on the top of a mountain range looking at the most stunning of views in complete and utter wilderness and silence.” Patience and Bithell secured the silver medal at the Perth 2011 ISAF Sailing World Championships and bronze medal at the 2011 470 European Championships. Defending European Champions Sime Fantela/Igor Marenic of Croatia have already qualified to the Olympics Games, and are planning to be in Scotland to defend their title. The 2011 Open European Champions, Mat Belcher/Malcolm Page (AUS) are currently the world #1 ranked team and the reigning World Champions and are also planning to be in Largs. Tara Pacheco/Berta Betanzos from Spain won the 2011 470 Women’s European Championship in July last year, and then wrapped up their season by winning the 470 Women’s World Championship title in December 2011. They have also confirmed they will be on the start line in Largs, before heading back to Weymouth for the Olympic Sailing Competition. As well as attracting the cream of Olympic sailors and aspirants, the Championship will also provide a great opportunity for local race officials and volunteers to get involved in a world class event. Around 80 volunteers from the host club and surrounding area are expected to be supporting the Championship, some of whom will then transfer their expertise to volunteer at the 2012 Olympic Sailing Competition. Racing will take place in the Largs/Cumbrae channel, between the mainland and the Isle of Cumbraeas well as North of the island, which is home to some of the most stunning scenery in Scotland. Shoreside, the Championship Opening Ceremony on Wednesday 27 June will welcome and entertain the teams with the traditional local pipe band, and throughout the Championship sailors will enjoy the lively seaside town of Largs, which is steeped in history and offers great Scottish hospitality. The 470 European Championship 2012 is being hosted by the Royal Yachting Association and supported through a partnership of UK Sport, EventScotland (the national events agency) North Ayrshire Council, the Scottish Sailing Institute, sportscotland and the International 470 Class Association. Esther Nicholls, Head of Major Events for UK Sport, the nation’s high performance sports agency, which recently helped secure the 2015 World Gymnastics Championships to be staged in Glasgow’s Kelvin Hall, said, “The 470 European Championships in Largs will be the final event to take place within UK Sport’s lead-in programme to the London 2012 Olympic and Paralympic Games. This will have seen more than 100 events in 40 different sports staged in the UK, giving our athletes and officials an excellent opportunity to prepare for the unique experience of international competition on home soil. Councillor David O'Neill, Leader of North Ayrshire Council said, “North Ayrshire Council is committed to developing the maritime leisure potential of its coastline and islands in order to become a key Clyde Estuary sail-to destination with a proven track record in hosting competitions and events to world championship level by the year 2012. “Working together in partnership we can create an outstanding sailing destination with international status. We are delighted to welcome the 470's to Largs and hope the competitors enjoy the warm Scottish hospitality and excellent events facilities at the Scottish Sailing Institute."